A researcher has an idea. The researcher writes a paper based on this idea. 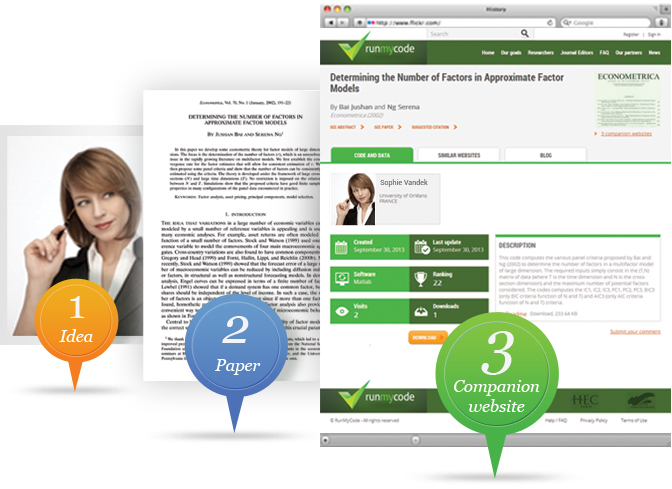 Using RunMyCode, the researcher creates a companion website associated with this paper. The companion website provides the code and data that allow people to implement the methodology and replicate the results presented in the paper. The RunMyCode website is operated by a not-profit making scientific association called the RunMyCode Association created by university professors. The mission of the Association is to make academic research easier to use and easier to replicate. RunMyCode is currently funded by several national research agencies and universities.